Thyme essential oil is extracted, by steam distillation, from the fresh or dried leaves and flowering tops of the plant. This is the Linalool chemotype, the most gentle variety of Thyme oils. The oil is mainly located in small glands on the leaves and contains thymol, paracymene & linalool. The main component of Thyme oil is Thymol, a powerful antiseptic which considered to be quite toxic if used improperly. It is common knowledge among aromatherapists that the essential oil of Thyme is one of the most potently antiseptic essential oils known. Thymol has been extensively documented for its antibacterial, antiviral, and anti-fungal action. According to Jean Valnet, M.D., Thyme oil kills the anthrax bacillus, the typhoid bacillus, meningococcus, and the agent responsible for tuberculosis and is active against salmonella and staphylococcus bacteria. In addition, this component has been studied for its effects on gingivitis and plaque-caused organisms in the mouth (it is used in Listerine for its antiseptic actions). Benchmark Thyme essential oil distilled from four strains of Thymus zygis (all ethically grown and harvested). The oil has been scientifically created to be highly antimicrobial while retaining the linalool chemotype's gentleness. We find it a little bit "hotter" than our c.t. linalool, but not so much as "red" and other thyme varieties. While being high in linalool, chemically (under GC analysis) is appears as a blend of thyme and tea tree essential oils. The oil has been created through research by Benchmark Oils of England to be one of the only single oils effective against MRSA staph infections, and a potent all-purpose antimicrobial. Containing Terpenine-4-ol (10%), considered the most active fraction of tea tree, it should be also strongly antiviral. The oil also contains a significant amout of Thymol, at 28.4%. This represents an incredible step in aromatherapy finding its way into modern medicine. See the research abstract evaluating the antimicrobial action. The Benchmark Thyme (it's name referring to it becoming an antimicrobial standard against which other oils will be evaluated) can be diffused or applied topically. It can replace tea tree as a topical antiseptic, and should be gentle enough for most individuals to use it "neat". If being used with children, dilute 50/50 with lavender before dabbing on any cuts or scrapes. 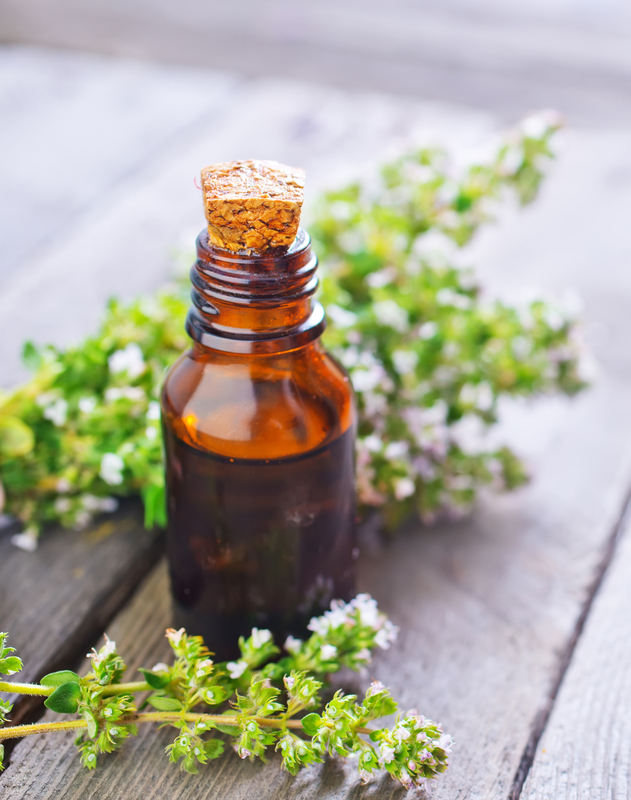 Thyme oil may strengthen the nerves and stimulate the brain in order to help memory and concentration. It may help to release mental blocks at the same time. The thymol content of Thyme essential oil works as an expectorant and cough suppressant and is frequently used in cough syrups prescribed for lung ailments like bronchitis; Thyme oil has a warming ability which helps to eliminate mucous and phlegm. When combined with fenugreek, Thyme essential oil works to relieve the pain of migraine headaches. The carminative properties of Thyme make it an effective treatment for stomach upsets. It may also increase the propensity of white blood cells, perhaps increasing the power of the immune system. Also, by possibly helping to eliminate excess uric acid from the body, conditions like gout, sciatica, arthritis, and rheumatism can be more easily combated. Thyme essential oil may valuable as a local application to neuralgic & rheumatic aches and pains. Thyme oil can be a stimulant for the digestive system, helping to eliminate worms, reduce gastric infections, and ease dyspepsia. Thyme is also good for headaches caused from gastric complaints. Thyme Oil may be good for the scalp, helping to treat dandruff and hair loss. Dermatitis, wounds, boils and carbuncles may also be diminished with this essential oil. To learn more about the use of all our essential oils, we encourage you to visit The Ananda Apothecary Forums, where you can post questions regarding specific applications of each oil. Questions in the forums are regularly answered by Ananda Apothecary staff, and other experienced aromatherapy practitioners. It is an ancient herb used in medicine by the Greeks, the Egyptians and the Romans and is an evergreen perennial shrub that grows up to 45 cm (18 inches) high, with a woody root system, much-branched stem, small elliptical greenish gray aromatic leaves and pale purple or white flowers. The name is derived from the Greek word 'thymos' that means 'perfume' and was used as an incense in Greek temples. The Egyptians used it in embalming process. During the Middle Ages it was given to jousting knights for courage, and a sprig of the herb was carried into courtrooms to ward off diseases. The warming effect of this oil can help in cases of poor circulation, as well as for arthritis, rheumatism, gout, muscular aches and pains, sprains and sport injuries. It is also helpful for cellulite, anorexia, obesity and edema and in cases of scanty periods, leucorrhoea, and to speed up birth and to expel afterbirth.